We no longer carry the 2005-10 Mustang Pacesetter Off Road Y-Pipe for Long Tube Headers V6 4.0. Check out 2005-2009 Mustang Mid Pipe & X-Pipes for an updated selection. 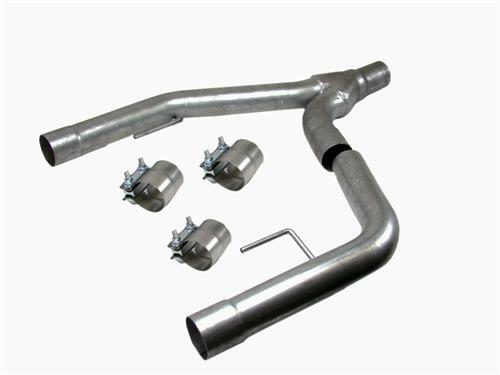 Get more power and exhaust tone for your 05-10 Mustang 4.0L V6 with an off road Pacesetter Y-pipe. PaceSetter Y pipe mid-pipes have been shown to deliver more power and a more powerful sound from your Mustang 2005-2010 4.0L Mustang V6. The Y Pipe design helps exhaust gasses merge more efficiently. PaceSetter Off-Road Y pipes are mandrel-bent from 2-1/2" diameter, 16-gauge aluminized tubing. Each fits 5-speed and automatic transmission applications. It is recommended that you buy an SVE tune to turn off the rear O2 sensors to prevent a check engine light.